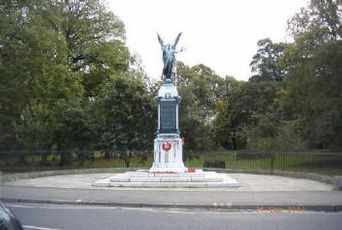 STANDING in a park close to the town centre, Ballymena's war memorial is a familiar object to most people passing by. War memorials are indeed very familiar objects. We accept them as parts of our cities, towns and villages. We are so used to seeing them that in some ways we fail to see them. They are brought into the public mind on particular dates of the year but otherwise, for most people, remain essentially invisible. Yet even a brief glance at a war memorial can provide food for thought. The obelisk in Ballymena, for example, lists nearly 500 names, all men from the Ballymena Urban and Rural Districts who did not return from the Great War. Stopping to look at the names, carefully cut into the stone in row after row after row, can be a sobering and thought provoking experience. Each of these men had his own story, as this website shows. In a similar way, each Great War memorial also has its own story. Each is the product of local initiative and local fundraising efforts, and each memorial is unique. In this article I hope to explain the reasons why these memorials exist at home, many miles distant from the places where those they commemorate died. I hope to show, too, that although Great War memorials all mark more or less the same events, this does not mean that they are all the same. Amongst County Antrim's memorials, that found in Ballymena also has a particular claim to fame. The public memorials to the dead of the Great War, in County Antrim and elsewhere, have their beginnings in the British Government's decision in 1915 that the bodies of the dead should not be brought home. This was a clear change of policy from previous conflicts, when those families who could afford to were free to repatriate the bodies of their relatives. The Government thus effectively took possession of the bodies, dictating where and how they would be buried, along with what kind of headstone or memorial would mark their graves. These were all questions which had previously been resolved by the families of the dead, and the Government's decision removed any opportunity for families to have any say in the arrangements being made for their loved ones. This decision (which, not surprisingly, proved extremely controversial) thus presented those at home with a painful difficulty. Traditionally, rituals of grief and mourning were focused around the body of the deceased, funeral services and the ability to visit a grave offering some degree of consolation to the bereaved. For those whose friends and relatives had died in the war, no such consolation was available. Bodies lay on foreign battlefields with names which were difficult to spell and pronounce, too distant to visit even if the war had not made such travel a difficult and dangerous undertaking. For many, even the knowledge that their loved one had been properly buried was denied to them. Instead, they had simply disappeared, registered as 'Missing', a classification which harboured more than enough uncertainty to nurture numerous hopes, doubts and insecurities. The Armistice in 1918 brought an end to the war but it could not resolve such difficult and personal issues. It became clear that the Government's 1915 decision would not be reversed: the bodies of the British Empire's war dead would remain, broadly speaking, where they had fallen. The Imperial War Graves Commission began its task of commemorating each of the Empire's dead, regardless of whether or not they had a known grave, constructing cemeteries and memorials on the former battlefields. At home, however, people were forced to come to terms with the fact that the dead would not be returning. A terrible absence had been created at the heart of communities. If this absence were to be made visible, and the grief of both individuals and the community more generally acknowledged, some new form of commemoration would have to be found. Yet war memorials in themselves were not a new concept. Memorials to the dead of the recent Boer War could already be seen inside churches and sometimes in public places. What made the Great War different was the sheer scale of the conflict. Never before had so many men and women offered their services to the armed forces, and never before had so many lost their lives as a result of that decision. Bringing these memorials into existence was rarely a straightforward process, however. Making a memorial involved finding answers to a whole series of questions, and the sheer number of different groups and individuals potentially interested in the project sometimes gave rise to vigorous debate. Some way had to be found of reconciling a number of different, and often very strongly held, viewpoints. The most common way of getting a memorial scheme off the ground was to hold a public meeting, at which a committee would be appointed to oversee the project. Such committees tended to include people who were already prominent in the locality: for example, many committees included members of local Urban, Rural and County Councils. They also often included leaders from the religious community, but on the whole, in the north of Ireland at least, did not tend to include many of the bereaved, ex-servicemen or women. Committees were also charged with fundraising for the memorial. Substantial sums of money were often brought in through a newspaper appeal for donations, while further funds could be raised through specific events such as sales and auctions, or special collections. Once the funds had been raised, committees had to decide how to spend it. Clearly their decisions were influenced to a large extent by how much money was available to them. A small obelisk, for example, was a much cheaper option than a statue cast in bronze, which in turn was likely to be more affordable than a memorial hall. Yet there was more to the issue than simply cost. Memorials were also the outcome of decisions about how best to commemorate the war dead. What was the most appropriate way of commemorating those men and women who had given their lives in a war which people had been told for four long years was for a variety of lofty aims, 'for civilisation, for freedom, for honour'. 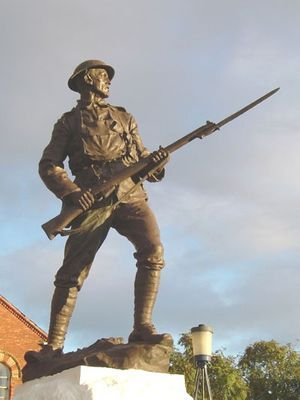 This article deals only with public war memorials, those erected in a public place and intended to commemorate men from a particular area like a town or village. Obviously many other memorials exist in, for example, schools, churches and workplaces, but they lie beyond the scope of this article. It also deals only with memorials erected before the outbreak of another World War in 1939. County Antrim is home to a total of 17 memorials which fall into this 'public' category. This places Antrim second in Northern Ireland: it is beaten only by County Down, which has 19 public memorials. Counties Tyrone and Londonderry both have 8, while Armagh has 6, Enniskillen 1, and a further 5 were erected in the Greater Belfast area. War memorials can be divided into two broad categories, and examples of both were erected in Antrim. The first category of memorials were those which were intended to have some practical use which would benefit the community. The dead had given their lives in order to make the world a better place, ran the argument, and therefore the most appropriate memorial was one which potentially improved the town or village where it was located, or the minds and lives of the individuals who would use it. This large, handsome and thoroughly equipped hall will be of practical use to the living for many generations to come, and be a fitting monument so long as one stone shall stand upon another to those in whose honour it has been erected. In each of these cases, however, the dead were not forgotten, since each hall and park had some feature to remind users that they were in the presence of a memorial. The hall at Dervock displayed a series of polished brass plaques listing the names of the dead and those who had survived, eight women amongst their number. The numbers 1914-1918 were to be seen above the door at the hall in Castlecatt. At Crumlin, visitors entered the park through an oak gateway inscribed with two lists of names, while at Ballyclare and Ballymena obelisks reminded passers by that the parks were intended as memorials. Despite their apparent popularity in Antrim, not everyone agreed that practical memorials were the most appropriate tribute, and the second category of public memorials were those which had no functions other than that of commemoration. Some people were concerned that the memorial aspect of a park or hall could be all too easily forgotten. Only a monument, they felt, could commemorate the dead properly. For many, 'stone infantrymen' may be the image which comes most readily to mind when thinking about war memorials, but in fact Country Antrim has only two soldier figures, neither of them, incidentally, made of stone! One stood in Larne alongside a sailor figure, backs to a Portland stone cenotaph outside the Midland Railway's Laharna Hotel (It now stands outside St Cedma's Parish Church). Another soldier figure stood alone in Bushmills, rifle and bayonet at the ready in the town's Diamond. The Coleraine Chronicle described the Bushmills figure as that 'of a typical Ulster Rifleman, with rifle and bayonet at the ready.' The figure is shown as if awaiting the onslaught of an enemy, or going into a bayonet charge? The only other piece of figurative sculpture in the county was to be seen at its southern edge in Lisburn. Here the memorial was graced by a figure of Victory, holding a laurel wreath and a sword, symbolically pointed downwards, in her bronze hands. Such figures, often representing Victory or Peace, were relatively popular across Northern Ireland but were rare south of the new border with the Irish Free State. The Round Tower was a very old kind of memorial. It had the sanction of ages, and seemed to [the committee] a monument that would commemorate for ever the most miraculous escape this country had from being overrun by the Germans; a monument that would remain for all time a credit to the town and to the men for whom it was to be put up. The committee gained the approval of what the local newspaper described as an 'eminent artist who had praised the scheme in the highest terms', and went to the trouble of preparing lantern slides illustrating how the tower would look on a number of proposed sites. From an early stage, however, the committee experienced opposition to the plan. 'Pro Bono Publico' wrote from Portrush to denounce the tower as 'neither useful nor ornamental' and this lack of enthusiasm seems to have been reasonably widespread, since the committee had great difficulty in collecting money towards the cost of the tower. At the outset we stated we were not interested in the various reasons and excuses for not giving. In spite of this we have had to listen to many, 'you should have erected a Town Hall', 'you should have made a public park', 'A Cottage Hospital', &c. &c., in short, 'anything and everything but the Tower'. Above: Galgorm Road in the pre-1914 era. The Memorial Park is found just beyond the large stone building on the left, the Protestant Hall. So far, it might appear that there is very little about County Antrim's memorials to the Great War that is distinctive or noteworthy. Obelisks, statues and memorial halls and parks can all be found elsewhere. Yet County Antrim's memorials do have a claim to fame, for amongst their number is a strong contender for the first permanent public Great War memorial in Ireland. At the centre of the county lies Ballymena, a town which, as this website shows, provided a large number of men for the armed forces, and as early as 1917, plans were afoot to honour those of their number who had been killed during the conflict. The scheme evolved from an idea in the mind of local landowner Sir Robert Adair. Adair owned a plot of land to the south west of the town centre, not far from the railway station, and in the spring of 1917 he wrote to the town's Urban District Council offering this plot as a 'Memorial Park.' The plot was, however, in poor condition: there was no fence or wall around it, while a water course had to be filled in and the foundation of a bridge under the road extended before anything further could be considered. Moves were made to remedy these faults, although the project was held up by a series of disputes over the precise line the boundary fences should take. Railings and a set of gates were ordered from the well known firm of Bayliss, Jones and Bayliss in Wolverhampton, England, but what is described in the Council Minutes as 'submarine trouble' in the Irish Sea prevented the delivery of the finished product for some time. The surviving Council minutes do not record the date of the gates arrival, but they were in place by June 1918. A few weeks later, on 1 July, the park was the venue for a service to mark the second anniversary of the opening day of the Battle of the Somme. That morning, the Council's Chairman laid a wreath at the gates in memory of the Ulster Division's dead. on Monday a beautiful memorial wreath was displayed on the gate of the Memorial Park, on the Galgorm Road, bearing the words ? Thus have we kept in remembrance the part our men played on the First July, 1916, at the Battle of the Somme, in the fight for freedom. Their memory will never fade. 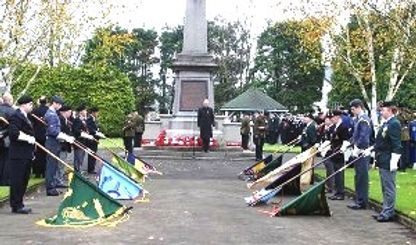 Even before the war had come to a close, then, Ballymena's Memorial Park was a place for commemorating the war dead. This appears to make it the first public memorial in the area which became Northern Ireland, and possibly also the first public memorial in Ireland. The first post war memorial appears to have been the monument in Stranocum, which was in place by April 1920, although it does not seem to have been formally unveiled. Today the park itself is well maintained, and in spring and summer the flower beds present a colourful face to passers-by. In November the trees may be bare but the park continues to provide place for commemorating several hundred men from Ballymena and district who gave their lives in two world wars. In this article I have tried to explain why people felt that memorials on the home front were necessary, and also show the variety of public memorials in one Irish county. If public memorials are the most visible of memorials, they are far exceeded in number by the numerous other memorials to be found inside buildings, commemorating those associated with a particular school, church or other organisation. All of these war memorials are part of our towns and villages. Their stories, and the stories of those whose deaths they mark, are part of our history. Perhaps we should all take time to look more closely when we pass them and see them for what they are: unique reminders of a traumatic time. T. Burke, 'Poppy Day' in the Irish Free State, Studies 92 (2003), 349-358. Jane Leonard, The twinge of memory: Armistice Day in Ireland since 1919, in R English and G Walker (Eds), Unionism in Modern Ireland (London, 1996). K. S. Inglis, Sacred Places: War Memorials in the Australian Landscape (Melbourne, 1998). Angela Gaffney, Aftermath: Commemorating the Great War in Wales (Cardiff, 1998). Jock Philips and Chris Maclean, The Sorrow and the Pride: New Zealand's War Memorials (Wellington, 1990).